The Episcopal Church property trial against congregations that voted overwhelmingly to separate from the Episcopal Church in 2006 ended this week, with more than 600 pages of legal briefs still expected to be filed by The Episcopal Church and the Diocese of Virginia. 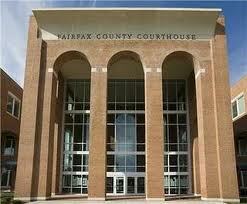 The seven-week trial in the Fairfax County Circuit Court was presided over by Judge Randy Bellows. The briefs should be completed in October with a ruling from Judge Bellows to follow. Both sides expect Judge Bellows to take his time in reviewing the briefs with a ruling expected some time next year. A dark shadow was cast over the proceedings with the unexpected death of the Diocese of Virginia's long-time chancellor, Russ Palmore the week before the trial began. 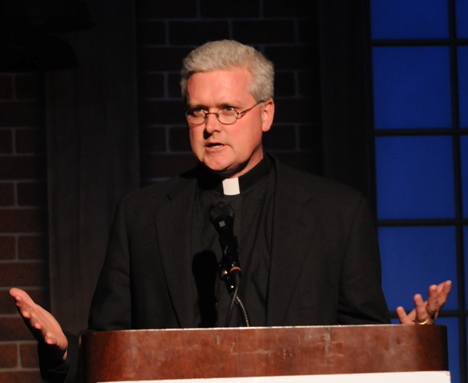 Russ Palmore was the chair of the Bishop's Special Committee and author of the Diocese of Virginia Protocol for Departing Congregations which outlined the steps the voting parishes followed to find an amicable way to separate. Bishop Schori at the National Cathedral. 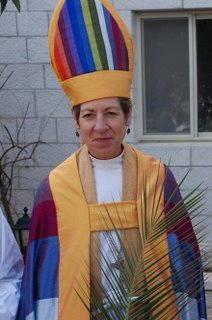 However, after the protocol was completed, a new Presiding Bishop was installed at Washington National Cathedral, the Most Rev'd Katharine Jefferts Schori who took a very different view then her predecessor over diocesan authority to negotiate with parishes voting to separate from the Episcopal Church. She authorized an intervention into the process which led to the abandonment by the Diocese of Virginia Protocol and Bishop Schori filed lawsuits against all the parishes as well as against nearly 200 lay volunteers. This was followed by Bishop Peter James Lee, then bishop of the Diocese of Virginia, filing parallel lawsuits as well. Bishop Lee later deposed over twenty clergy who had voted to separate and with Anglican Communion provinces in Nigeria and Uganda. The Anglican Churches in Nigeria and Uganda and The Episcopal Churches are part of the worldwide Anglican Communion. Judge Bellows in the Circuit Court. 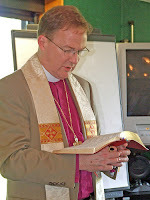 The Episcopal Church lawsuits were set aside by Judge Randy Bellow while the challenge by the Episcopal Church and the Diocese of Virginia to the law used by the protocol and the congregations in guiding the vote to separate, Statute 57-9 of the Commonwealth of Virginia. Judge Bellows ruled in favor of the departing congregations , affirming that the law applied and was followed. That ruling was overturned last year by the Virginia Supreme Court in Richmond. With the overturning by the Virginia Court of of the Circuit Court 57-9 ruling, the focus of attention returned to the original 2007 lawsuits filed by Bishop Schori and Bishop Lee. Attorneys from both sides expect a ruling some time next year, six years after the original parish voted to separate. Tory Baucum, Rector of Truro. On Wednesday, the trial in the church property lawsuits filed against us and six of our sister churches wrapped up. There were 22 days of trial stretching over almost seven weeks. I have been told that Fairfax County Circuit Judge Randy I. Bellows heard testimony from more than 65 witnesses and that literally thousands of documents were put into evidence. Paul Julienne, Ernie Wakeham, Doug LeMasters, Tom Yates and Chap Peterson testified on behalf of Truro. Those present in the trial courtroom have told me our legal team and witnesses have represented us well. I want to especially commend George Peterson, our lead attorney, who continues to put heart and soul into advocating for us. Pray that God restores him and Tania in the weeks ahead. Their recent marriage, and their friendship to me, is an unexpected blessing having already come out of this trial. I receive this blessing as a promissory note of future blessings. With the trial completed, the case now moves into the next phase, in which the lawyers for each side submit to the Court their written arguments about the evidence presented at trial and the controlling law. Each side will submit three sets of briefs - in August, September, and October - up to a total of 600 pages per side. Judge Bellows has said that after all of this briefing is finished, he will set another day for the lawyers to come back to court to answer any questions he has. 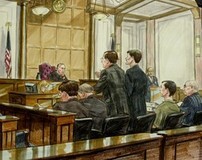 His final ruling may not occur until early 2012. I know that many of you are praying, and I urge you to continue to do so. Pray that God will somehow be glorified in this dispute and that we can, even at this late hour, find a mutual and redemptive outcome with the diocese of VA. Pray especially for Bishop Shannon Johnston, whom I have come to know as a good man who inherited this ungodly litigation. Pray that God gives him wisdom and perseverance to find a redemptive way forward. Please pray for continued wisdom and discernment for Judge Bellows as he considers all of the testimony, evidence, and legal arguments and as he prepares his decision. Above all, please pray that the Lord Jesus Christ would be honored and exalted by all that we do and by all that occurs, including the final outcome. Finally, I ask you pray for me, Elizabeth and the girls that we will have the wisdom, grace and stamina to love and lead Truro through this set of circumstances. We want, above all, for our God to be glorified in this situation and for people outside of faith in Jesus be drawn to him - and we believe He will be. OK - well, leaving aside the much ventilated differences of view about the history of the Protocol and the events of early 2007, let's just assume that the Court finds the protocol binding. What's the fullest victory that the departing groups can achieve in that scenario? Under the Protocol, they would have had to enter negotiations with the Diocese and the remaining Episcopalians in an effort to find a mutually agreeable price for the properties and some means of protecting the interests of the continuing Episcopalian groups. So, a win in court now based on the Protocol would place the departing groups precisely where they would have been in 2007 had they not rushed to court to try to get the whole shebang for nothing under the Division Statute. I don't think the Protocol is going to have much impact on the legal disposition, but because it is such a hearty perennial around here, and because I well could be wrong about the way it is applied by the court, it is probably worth focussing on how limited its practical impact is in resolving property issues. What it provided, had it been approved by the Diocese, was a framework for defining that a group had left and the identity of that group. While I love Scout's hypotheticals, in this case it's not worth pursuing. The departed churches' attorney conceded in court that they do not contend the Protocol was binding. So the court won't be finding that it is. The legal impact of the protocol is really questionable. It's been great PR, but legally, I don't know. Anon 1522 - fair enough. I was just trying to say something new or, failing that, at least talk in a new way about the Protocol. It seems to have such staying power around here. Perhaps one reason that the departing groups didn't press it hard in court is because they realize that it doesn't really resolve anything legally. Truly, God alone knows what the next months will bring. And from what we see, the Protocol "doesn't really resolve anything legally." But I do wonder if Scout el. al. will ever move beyond the relativism implied in "the much ventilated differences of view," and do an honest reading of the document. At the end of the day, not everything can be a matter of different perspectives. Either Bishop Lee, with the principal assistance of Mr. Palmore, instructed leaders of the Diocese of Virginia to create a structure for peaceable separation, or he did not. From the deposition in the first round of the court hearings, it is clear that he in fact changed his mind when "a new sheriff came to town," i.e. Katherine Schiori. None of what has happened-- socially, legally, financially --would have happened, if he had been a man of his word, and had the courage of convictions that men of good faith are known for throughout the Church's history. What is legally binding is not the same as what is morally binding. "Peaceable separation" was never a problem. People can always leave a church, whether by themselves, with a few others, or in large groups. I think my point, AH, is that the Protocol only provided a structure for people to leave the Diocese. It did not provide for any particular disposition of property other than to say that if sufficient folks left, they could make an offer for property in a context that fairly compensated the Diocese for the value of the property AND that protected those in the parish who remained with the Episcopal Church. But the Protocol was not accepted by the Diocesan councils, and the the departing groups rushed to court, making it impossible for the Diocese to do anything but oppose their efforts to seize title. Failure to act would have resulted in a default. As our confrere this afternoon pointed out, it is of no legal significance at this point. Bishop Lee acted generously and honestly. I think he was naive, and I suspect the Standing Committee felt the same way. But one can't impugn his character on this one. "[T]he the departing groups rushed to court, making it impossible for the Diocese to do anything but oppose their efforts to seize title." Actually, the departing groups filed their 57-9 petitions pursuant to the Standstill Agreement, under which the Diocese committed to negotiate, but did not. The Diocese then filed lawsuits. To this day, no one has sufficiently explained how the Diocese could put its name to a document committing itself to negotiate and consenting to the filing of the petitions, then walk away, and then turn around and claim the departing groups are the wrongdoers. And now a reading from the "Litany of the Protocol," the verses in bold will be read by the departing Episcopalians the verses in italics by those who remained. My point here is that after so many years it is certain that everyone here knows where everyone else stands and nobody's mind will be changed. The only mind of I have seen shift recently is Bishop Epting's who wrote,"it seems wise to me to err on the side of charity and allow seeds to germinate and spring up where they will. As in the parable of the wheat and the tares, the final judgment will be up to God, not us. Until then, let us all try to be faithful together." "Actually, the departing groups filed their 57-9 petitions pursuant to the Standstill Agreement, under which the Diocese committed to negotiate, but did not. The Diocese then filed lawsuits. To this day, no one has sufficiently explained how the Diocese could put its name to a document committing itself to negotiate and consenting to the filing of the petitions, then walk away, and then turn around and claim the departing groups are the wrongdoers." The 57-9 petitions were filed pursuant to 57-9, obviously. The Standstill Agreement had nothing to do with the basis for the CANA folks' lawsuits. And only people who are entirely incapable of understanding a pretty simple legal document think that 1) it remained relevant after January 2007, and 2) it somehow means that the 57-9 lawsuits weren't actually lawsuits. When it comes to negotiations, both sides (the Diocese and the CANA folks) agreed to seek in good faith to negotiate a resolution. And their lawyers had a few meetings, both before and after the CANA folks filed suit. But those meetings did little but confirm that the CANA folks and the Diocese weren't even in the same ballpark. That plus the already broken relationship (caused in large part by years of scheming and denunciations from the CANA folks -- now fully documented after this last trial and which the Diocese had finally begun to realize by December 2006), plus the national church's final position, made continuing meetings pointless. But is this "sufficient" for Steven? Doubtful. Like his side's legal/negotiating position was, nothing but everything exactly on the terms demanded will satisfy, I expect. If one pursues an alternate history scenario where the departing group did not go to court and the Diocese thus felt no need to defend in that action or tee up their own litigation, I think it is doubtful in the 2007-2007 period that there ever could have been a meeting of the minds on a property transfer, at least not for the historic parishes of Truro and The Falls Church. For the Diocese, the fair price would have been in the tens of millions, if not priceless (as they say in the credit card ads). I think it would have been a very big gulf across which to reach an accord, even with all parties acting in the utmost good faith. 57-9 really made it impossible to even talk about it, however, because it held out the possibility to those who left the Diocese that they could get the whole shebang for nothing. If you think that's a reasonable possibility, it's hard to get your negotiation game face on. You might as well just wait and see if a windfall occurs. A win by TEC would be like the success of a python that finds the dead prey too big to swallow. These properties will never again be viable Episcopal churches. Should TEC win, the properties will be sold to provide funds allowing the cast to play to an ever decreasing audience. If the departing congregations win the properties, they can continue to fulfill the charge of the Great Commission. Ralph: the properties were never essential to either side's fulfilling the charge of the Great Commission. Both sides can do that with or without the properties. The departing groups' attempt to seize the properties was a costly distraction from the Commission. The properties will never again be viable Episcopal churches? I don't mean to be ad hominem, but that's just nonsense. God speaks through the Episcopal Church, as he speaks through the CANA denomination. Do not presume to know what God will do. What God has done in the past is a pretty good indication of what he will do in the future. I will grant the fact that there is one VA church that could possibly be supported by the Episcopal remnant, but only one. The only relevant point in determining ownership is who has title. This won't be decided (thankfully, given that none of us wants governments making religious value judgments) by a court making a judgment on which group will best advance the Great Commission. "The only relevant point in determining ownership is who has title." Scout, for once I agree with you. We have title to the property, and that indeed is what should count. Also, Ralph's point about non-viability of the TEC congregations is beyond cavil. For Truro, there is no purported congregation waiting in the wings. For TFC, the continuing congregation is drawing only 74 per average Sunday according to its 2010 annual report -- about 1/30 what TFC draws per weekend -- and more importantly for the basic issue of viability has total income of only about $234K, which is about half of what TFC spends on building and maintenance alone. We're not likely to see much improvement to these numbers given the horrendous demographic trends across TEC. After the nonsense with Good Shephard in Binghamton NY -- suing Christians out of their church home and then quickly selling the property to Muslims -- I am convinced that TEC is engaged in what can be called Gordon Gekko litigation, pursuing properties for their break-up and liquidation value, rather than to hold on to them for purposes of ministry. If only we all knew the future as well as the posters here. Both Scout and Steven iFC are way off base. Title is not at issue -- everyone knows who the trustees are. Everyone also agrees that the trustees are purely functionaries, which makes their holding of title meaningless. The issue can be phrased in different ways, but it is not who holds title. Indeed "we" do, Steven. The question, I guess, is who's "we". I would think it clear that the continuing Episcopal congregation and the Diocese did nothing to extinguish their rights to possession and that a bunch of people leaving could not have had the effect of transitioning title to someone else. I think I'm closer to DavidH than to Steven in this regard. Perhaps I phrased it a bit clumsily in my earlier comment. I continue to ask where in the canons of the Episcopal Church, whether at the national, Diocesan, or parish level, are provisions that explain how a bunch of folks deciding to find a new affiliation get to lay claim to a possessory interest in the physical assets of an Episcopal Church. I don't know of any basis on which that could happen. Similarly, I have no concept in civil, secular law how such a right would spring into being on the occasion of people deciding to change their religious or denominational affiliation. As to the numbers, it's irrelevant. I have no doubt that The Falls Church will continue to thrive in the future as it has for nearly three centuries. This squatter or occupation period will be a footnote when we celebrate the tricentennial, or whatever one calls it. "As to the numbers, it's irrelevant." Baghdad Bob, is that you? I hope there is a Dylan concert or something of the like in your life soon. 0821: The numbers are irrelevant to legal ownership. I'm sure they have some significance in some context unrelated to that issue.